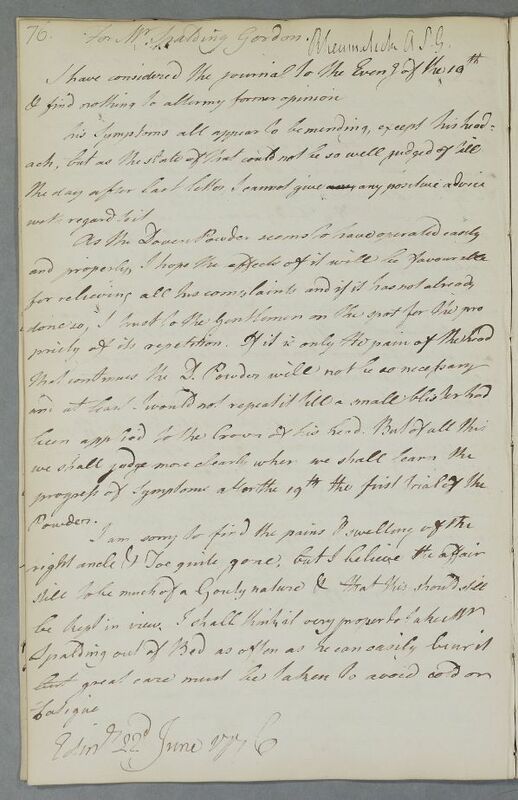 Reply to Dr John Gilchrist, headed 'For Mr Spalding Gordon', responding to Gilchrist's 'journal' of the case sent on the 19th, and concerning how to continue treatment for a gouty condition. Summary Reply to Dr John Gilchrist, headed 'For Mr Spalding Gordon', responding to Gilchrist's 'journal' of the case sent on the 19th, and concerning how to continue treatment for a gouty condition. Case of Mr Alexander Spalding Gordon who has a venereal infection in 1775; in 1776 he has a swollen ankle and toe assumed to be gouty; and in 1784 he is suffering from the after-effects of an accidental pistol wound.